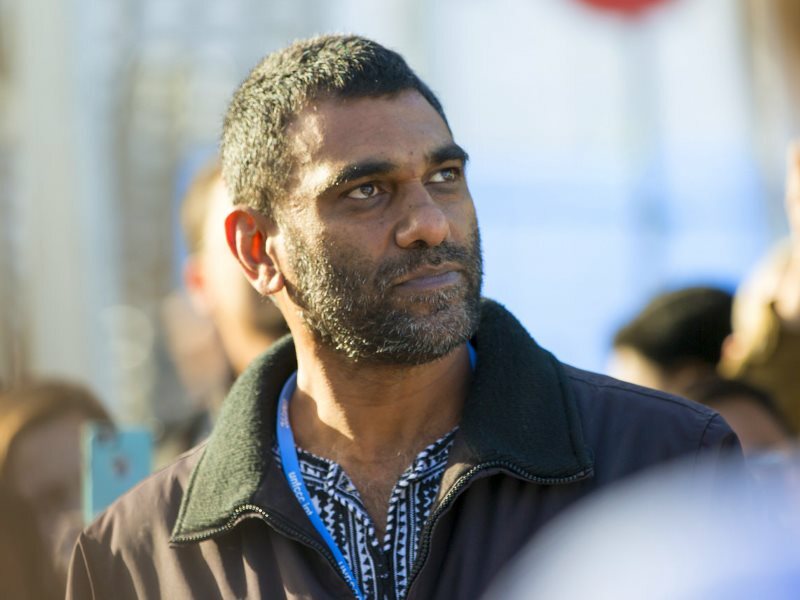 Kumi Naidoo was born in South Africa, and became involved in the country’s liberation struggle at the age of 15. His early community work and anti-apartheid activity led him to exile in England, until Nelson Mandela’s release in 1990. He went on to become one of the leading figures of the civil society movement in South Africa, and now is one of the chief global figures of the climate justice movement. Naidoo, now International Executive Director of Greenpeace, was at COP21 to join his voice with thousands of climate activists, encouraging citizens to rise up for a renewables revolution. Dressed in traditional South African attire, Kumi welcomed me with a strong handshake, his deep voice projecting both hope and scepticism. “The good thing about COP21 is that for the first time we have a great multilateral agreement to address climate change. This is the first time such a large number of countries agree on something, since the adoption of the Universal Declaration of Human Rights (UDHR) in 1948, again in Paris. In his view, the most crucial work begins now, and is important to see what types of action will emerge in the next weeks and months after Paris. Despite delays and conflicting opinions, at the end governments came up with the $100 billion support towards climate action. “They fudged the language here and there, but they had no other choice. If developed countries did not deliver on that, poor countries would not sign on to anything unless they got a guarantee that they are going to have predictable and transparent sources of funding. “For every one dollar that is given to Africa, eight dollars are going out in capital flight. Therefore, it is important that the Green Climate Fund is set up in a way that takes that injustice into consideration. We cannot allow the current messed up banking system consume the world’s most vulnerable countries, that need funds to protect themselves from catastrophic climate change. This exact case, highlights the big injustice existing in climate finance right now, where loans could leave all these countries back in a deep, unplayable debt situation. “But, why go to Kiribati, when there is Greece, a country you could get from Paris on a bicycle, to see it for yourself”, Naidoo says. In his words, climate change presents us with a very powerful opportunity. “For far too long, we lived in a world divided between rich and poor, north and south, east and west, developed and developing. “What we need right now is not just baby steps in the right direction, given how much time we have already lost. We need substantial, structural, systemic change. And this change can only be led by the youth, who are not infected by the political pollution of the past”. Originally published at The Ecologist.